The many features of the Harbortouch Elite POS System helps run a business efficiently. Cast-aluminum stand and shell for a sleek and modern appearance with maximum durability. 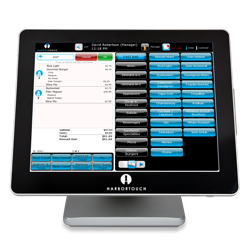 The Harbortouch Echo POS System produces data at your fingertips with advanced reporting capabilities. Gulf Coast Merchant Services is happy to serve our customers during business hours or our 24 hour tech support services. types such as Apple Pay, NFC and EMV. delivers blazingly fast speed and flawless performance. all the hassle or the high cost. A group of approved credit card transactions usually accumulated during one business day. This is also referred to as a settlement. How often should I batch my terminal? Your terminal must be batched on a daily basis to avoid higher processing costs. What is a declined transaction? This indicates that the issuer does not approve the transaction. Please do not continue with the transaction or attempt to force through/run again. Instead, request an alternative method of payment. How long will it take to receive my money from my credit card payments? All payments are transferred within 24/48 business hours from the day the terminal is batched. What is a fraudulent transaction? The cardholder is claiming that they were not in possession of the card at the time of sale and that they did not authorize or participate in the transaction. The merchant must supply proof that the transaction occurred, was authorized, and that the cardholder had knowledge of the sale, etc. (Refer to “Merchant Action Necessary” portion of Chargeback documentation). Harbortouch has begun an exciting new partnership with Jon Taffer, Executive Producer and Host of Spike TV's "Bar Rescue" and the foremost expert in the hospitality industry!